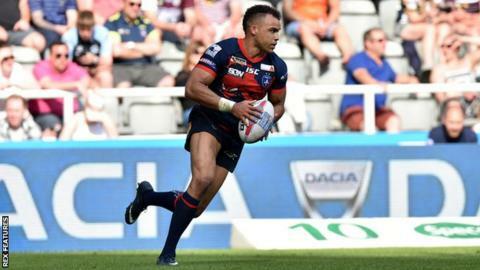 Wakefield Trinity have re-signed winger Mason Caton-Brown on a deal until the end of the season. The 25-year-old first joined the club in 2017 before leaving for Toronto Wolfpack last summer. Head coach Chris Chester identified Caton-Brown as a target last month after England winger Tom Johnstone suffered a serious knee injury. He goes straight into the squad for Thursday's derby against Castleford, who are one place above Wakefield. Chester told the club website: "Mason knows what we are all about and we know what Mason is all about. It's a really good fit." Caton-Brown, who began his career in rugby union as a teenager, has recently been playing sevens in Hong Kong. "It was something I have always wanted to do," he said in an interview posted on Wakefield's Twitter page. "I enjoyed it and always planned to come back to league. I can't wait to get stuck in."